Spider-man is a fictional character appearing in comic books published by Marvel Comics. Spider-man was created by Stan Lee and Steve Ditko and first appeared in Amazing Fantasy #15(August 1962). Spider-man is considered as the best Marvel superhero and is referred to by titles such as Web-Slinger and Web-Head. Spider-man's alter ego is Peter Parker, a teenager who was orphaned at a very young age and was raised by his aunt and uncle. Spider-man was an immediate success since most of the readers were teenagers and could relate to him. In 1962 after the success of Fantastic Four, Stan Lee had ideas for a new superhero which arose from the teenage demand for comic books. He wanted to create a superhero to whom teenagers could relate to. Stan Lee developed the character's background and Steve Ditko designed the costume. 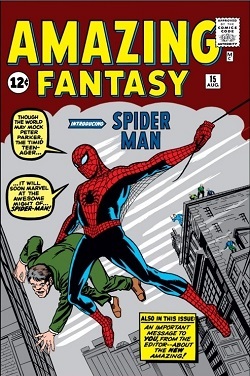 Spider-man debuted in Amazing Fantasy #15 and was an instant hit. Orphaned as a child when his parents Richard and Mary Parker were killed in a plane crash, Peter Parker was raised by his Aunt May and Uncle Ben. He was a very gifted child in terms of academics, but was very socially awkward and shy and was hence a victim of bullying. When he was 15, he was attending a science fair and was bit by a radioactive spider which gave him the proportional strength and agility of a spider and the ability to cling to walls. He also gained a sixth sense which he calls his spidey sense which warns of any danger. Using his scientific prowess he designed a couple of web shooters which would shoot high tensile web to help him swing across buildings. With an agent, a costume, and a new name, Spider-Man became an overnight sensation on television. Unconcerned with the rest of the world, he vowed to use his powers only to take care of himself and his aunt and uncle. After his first TV special ended, he allowed a burglar that he could have easily restrained to run past him and escape. A few days later, Peter returned home to find his beloved Uncle Ben had been shot and killed. When Spider-Man confronted the killer hiding in the old Acme Warehouse at the waterfront, he discovered to his horror that his uncle's murderer was the burglar he apathetically allowed to pass. Consumed with guilt, he became aware at last that with great power comes great responsibility, just as his beloved uncle had once said. Spider-man has numerous abilities including Superhuman strength, speed and agility. He also has the ability to cling to most surfaces, he has genius level intellect, precognitive Spider-sense and also utilizes web-shooters to shoot strong spider-web strings from wrists. This mechanism ejects an advanced adhesive, releasing web-fluid in a variety of configurations, including a single rope-like strand to swing from, a net to snare or bind enemies, and a simple glob to foul machinery or blind an opponent. He can also weave the web material into simple forms like a shield, a spherical protection or hemispherical barrier, a club, or a hang-glider wing. Spider-man has a number of supporting characters including his uncle and father figure Benjamin Parker, his aunt May Parker, his romantic interests Gwen Stacy and Mary Jane, his best friend Harry Osborn and his employer J. Jonah Jameson. On occasion members of the Avengers like Iron Man and Captain America also provide help. Spider-man has developed a number of enemies over the years, his archenemy being the Green Goblin. There are many more enemies like Venom, Carnage, Vulture, Electro, Doctor Octopus, Rhino, Sandman, etc. This movie was the sequel to the Spider-man and was also directed by Sam Raimi. 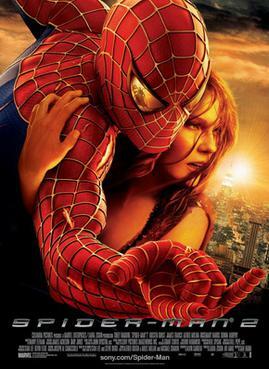 The movie featured Tobey Maguire reprising his role as Spider-man, James Franco as Harry Osborn and Kirsten Dunst as Mary Jane. It also featured Alfred Molina as Dr. Otto Octavius/Doctor Octopus. This movie was considered the best of the three movies and performed well both critically and financially. Spider-man 3 was also directed by Sam Raimi and featured Tobey Maguire reprising his role as Spider-man,Kirsten Dunst as Mary Jane and James Franco as Harry Osborn. The movie also featured Topher Grace as Eddie Brock and Thomas Haden Church as Sandman.Though the movie performed well at the box office,it did not perform well critically and disappointed many fans. In 2012 Sony Entertainment released The Amazing Spider-man. The movie was directed by Marc Webb. The movie featured Andrew Garfield as Peter Parker/Spider-man, Emma Stone as Gwen Stacy, Rhys Ifans as Dr. Curt Connors and Sally Field as May Parker/Aunt May.This was the first Spider-man movie which featured web-shooters like in the comics. The movie performed well financially but received mixed reviews. This movie was the second movie directed by Marc Webb and featured Andrew Garfield reprising his role as Spider-man, Emma Stone as Gwen Stacy, Sally Field as Aunt May. It also featured Jaime Foxx as Electro, Dane DeHaan as Harry Osborn/New Goblin and Paul Giamatti as Rhino. The movie was a financial success but received mixed reviews. Since Sony owned the rights to Spider-man, Marvel couldn't use Spider-man in their movies,many fans wanted to see Spider-man working along side the Avengers like in the comic books, therefore Sony and Marvel made a deal so that Spider-man could be in the Marvel Cinematic Universe(MCU), which again resulted in Spider-man being rebooted. Spider-man made a cameo appearance in the movie. The movie featured Tom Holland as Spider-man and Marissa Tomei as May Parker/Aunt May. Spider-man: Homecoming is an upcoming movie featuring Tom-Holland as Spider-man, Marissa Tomei as Aunt May and Robert Downey Jr. as Tony Stark/Iron Man. The movie will be directed by John Watts. Ultimate Spider-man is an animated TV series based on the Ultimate Spider-man comic books which is an alternate universe where Spider-man is a teenager. The series is performing successfully and is currently in it's 4th season. The series features Drake Bell as Peter Parker/Spider-man, J.K.Simmons as J.Jonah Jameson, Ogie Banks as Luke Cage/Power man and Greg Cipes as Danny Rand/Iron Fist.